I tend not to write too much about our non-quilting life so you may not know that over the last few years my husband - who is a teacher- has been suffering with a serious problem with his voice. He has had several operations and an oddly frightening moment when, after a biopsy they told him that he did not have throat cancer. ( They never told him that they thought he did!). After a long cycle of having prolonged periods of school and being unable to communicate well, his voice getting better, him returning to school for a while and then losing it again and being off, the medics started to tell him to consider an early retirement. It is fair to say that he needed some time to come to terms with this but after a year or so and another cycle of the above he decided enough was enough. Not only did he have one of our top ENT surgeons on side but our GP also happens to be an ENT specialist so we could not have had better advice and support. So, reports were gathered, courage was summonsed and the application went to the Teachers Pension Scheme for early retirement. And was promptly rejected. The rejection was on the rather stupid basis that there was no evidence that he could not teach one to one ( There is no such job in a school) and on the rather less stupid reason ( from my lawyers point of view) that the main ENT surgeon's report said at one point ,"Cannot teach in the future" and then "may not be able to teach in the future." They took the latter as implying a possibility of recovery. I did not see this report before it went in, but I did immediately write an apoplectic letter demanding he write an addendum more along the lines of the advice he gave Dennis which was in essence, continue to teach and you run a serious risk of losing your voice for life. Dennis went to yet another appointment to have a camera shoved down his throat. The surgeon was also apoplectic. He is Indian and it turns out that when he was taught English in India they were taught that 'can' and 'may' meant the same and were simply interchangeable. Sadly in English English they are not. A fresh application was prepared. The surgeons report was as clear as a Swarovski crystal and just to assist the 'little doctor who is not even in practice - how dare she not believe my report' making the decision, a video of the throat examination was provided. It shows the missing mucus at the back of the throat which is the essence of the problem. (Or, rather, it shows the lack of mucus...!) Off he goes to the occupational health team who have to sign the application. there a doctor tells him that it appears all applications are being refused at the moment - even really serious cases - and not to hold his breath. I gear up to draft appeal papers and Dennis posts the application recorded delivery. It goes missing, video and all. He is not happy. The post office agreed to help us trace it but it would take 16 days. Given that the school were threatening to dismiss him anyway because he can't do his job due to illness ( yes, there is indeed a fundamental contradiction in the system there) on 31st this month the timetable was becoming crucial. Then yesterday we arrived home and a letter was awaiting - his application was accepted. He is now a 57 year old pensioner! It is odd to celebrate such a necessity but the relief from stress is great for him and the different between that and just taking his pension early without the medical grounds is significant ( by around the sum of my commodious quilting budget!) The terms of his retirement mean that he can still work in jobs that do not require use of his voice and so in my other capacity as Queen I have appointed him Royal Quilting Chauffeur. By co-incidence we go to Bath for a well deserved break for both of us tonight so the blog may be sparse for a while but we shall be having a happy time. He deserves it. A supplementary question to my post last night. This is mostly for those of you who have a professional out-of-the-home, non-quilting related career or did in the past..... how much do you talk about your art/quiltmaking at work? Are you comfortable letting people know that in your spare time you are an artists or is it something you keep private? If the latter why? Is it for example because you just like separation of work and home? Is it because you feel it will minimise you in some way in the eyes of colleagues? Or maybe you even find it helps you stand out in interviews? Ok, thats more than one question but you get the point! The concept of achieving a work-life balance has maybe become a bit hackneyed as a term over the last few years but as a reality it is something I have been trying very hard to get right. I love my work but the problem is that in reality I am employed part time for a variable and uncertain number of days at one job and self employed in two other jobs at the same time ( all of which are related to law), with aspirations to keep up the paying hobby of freelance writing from time to time. Making sure that there is a sensible and sustainable balance of these three primary sources of income, is hard enough but then I have to add onto that the fight to get a life outside of work. Not easy when the self employment necessarily involved travel around the country and papers that arrive in the late afternoon by email or, worse, in the evening by motor cycle courier. In 2006 I decided not to take bookings to work in court or lecture in Mondays. This resulted in a loss of income but meant I had a day free for prep and paperwork which is a large part of the job. The knock on of that is that I got my weekends free. (Mostly. When it works!). I am sure that it is no co-incidence that it was at the same time that I accidentally discovered quilting. I had time to have a go and, well.... the rest is history and a blog. Why I am thinking about this tonight? Well first because I am blogging from a residential course in Warwick. Downstairs the event is still ongoing ( it is now 10pm). Most of my colleagues are either in the bar watching a football match together, listing to a string quartet brought in for our delectation or - assuming someone responded to the notice on the lecture hall door earlier -having a couple of rubbers of bridge. Me? I left after desert and have spent the last hour watching Jamie Oliver teaching Rotherham how to cook and hand quilting my City and Guilds cushion. Does this make me anti-social? Did I make a big mistake telling my colleagues that was what I was going to do? Do I care? Well, actually I am having a little crisis of confidence that I might have got it wrong and let the life overtake the work inappropriately on this occasion. But then, my day started at 8am this morning with a communal breakfast and I have been with my colleagues until 9.15pm. Is that not enough?! Fed up with almost-but-not-quite-finished projects and aware of pending deadlines for some swaps, on Tuesday I designated this Finish Up Week and wrote a ridiculously long list of things to get done. I then did nothing for three days but tidy up my room. So, I am inordinately pleased that there are only three tasks left on my list for tomorrow. The best thing was finally completing this bag which has been hanging around for ages. It is the first of my five final pieces for my City and Guilds. It is sized to hold my machine extension table and two large plastic project boxes for when I quilt away so it is a substantial bag. It is inspired by Nigerian Egungun masquerade costumes. I got the borders done on my Spring Fling quilt but the rules mean I can only give you this sneak preview. I had a panic because the centre sent to me was made from the kind of fabric I would never buy.. and yet there appeared to be two suitable additions in my stash somehow. I have no idea where they came from! This little block for the Birthday block swap was a delight to sew as I collapsed in front of an episode of The Quilt show Late this afternoon. And hexagons are the order of the day with this sample for my City and Guilds. Other tasks are much more boring like this label. I really don't care much for the machine embroidered text but it was quick and will do for this give away quilt. The quilt is called Greenfingers. It was going to be called Grandfather's Garden but then I spotted there was no apostrophe available on my machine! I also worked on my second City and Guilds piece which is required to focus mainly on quilting. This is the front, inspired by African Kuba cloths. It has some Italian corded quiting on it as well as machine quilting - it is not pieced but rather has little mini-quilts on mini-quilts attached to it. Still to do - hand quilting on the back of the cushion, which will be a handy thing to do in the C&G class tomorrow. The photo does not show it well but it has a pattern marked on the yellowing strip which took forever to draft then transfer using the patio doors as a light box. I also want to work on finishing up the books holding all the design work for the two projects. Sadly I also have a load of work to read on Insolvency and Consumer Law for a three day residential Judicial course commencing in Warwick on Monday so it might not get done this weekend... but the course timetable seems to give us an hour or so between last seminar and dinner so.....! There seems to be no rhyme and reason to which of my posts gets the most comments. Asking questions sometimes works to boost numbers but high single figures seems a good day. I accept that many people read but have no time and inclination to comment which is fine. I just need enought comments to know that there is someone out there reading. And I myself don't always have time/ inclination to comment on every post I read either. So I am chilled about it. Or I was. Erica had a link I followed to this. Of course, if you go there you will see why. and this is just the pile of leaftlets, brochures, business cards etc from Festival of Quilts, Great Northern Quilt show and Fashion and Embroidery show. And now I am too tired to sew! and named after the border quilting pattern I made up on the hoof of which I am very proud and which I shall probably be repeating! The center is also quilted with free motion flowers. Dennis tells me that the pattern is fine in case the as yet unborn recipient is a boy (and the little boy who lives inside him agrees). It is 36 x 36 and quilted with green variegated Rainbows thread from Superior - a trilobal polyester which has a bit of a sheen. Somehow I always seem to finish quilts just as it goes dark and the colours of the thread consequently never photo well. I had a whole pile of FQs to take to Brenda's class yesterday and it occurred to me before I left that if I took them in the folded state they were bought in I'd spend a chunk of the class ironing the creases out. So I ironed them at home, wrapped them around a plastic tube I got from goodness knows where, which I had saved for shibori dying. I tied the roll with wool. Not only did I simply arrive at class, unroll and start cutting, on the journey, I was able to drool over the titilating promise of the hidden fabric. This weekend I got to go to Chilcompton to take a class with Brenda of Serendipity Quilting and a fellow Twelveby12 quilter. Many gold stars must go to Dennis who did all 10 hours of driving there and back while I whimpered in the passenger seat about not feeling well with my head cold When I was awake that is. En route we did a short detour off the M6 to visit Goose Chase quilting. It is a small shop with a large stock but most of it was piled all over the floor by the narrow aisle so it was hard to browse it. Also the unfriendly shop assistant looked very unhappy at the prospect of me taking photos of the inside even when I explained to her it was for publicity for the shop. First time that has happened to me. In revenge I limited myself to merely a meter of fabric. Then on to Midsomer Quilting where I spent £116 which I think gives you an idea of the quality of the welcome! Without any planning at all Brenda and I arrived in the car park at the same time. Despite never having met we quickly established that we are quilting sisters. The Laundry King (David, Brenda's husband) was also there and I am told spent some time checking with Dennis whether I was as obsessed with quilting and the Internet as Brenda was. Apparently I am. We spent last might in the Rajpoot Indian restaurant in Bath and then today Brenda taught her Waking Waves Workshop and took opportunity to show case the techniques used in her mini quilts made in practice of her final Twelveby12 quilts at the same time. As you can see, she can hold a crowd! Half way through the day I remembered that my Cousin's wife is pregnant and given that Caleb her first child got this quilt I might as well make my blocks into a cot quilt. So I got on with things and here it is. I have to say that it is my bastardisation of Brenda's techniques because as I had already done curved piecing she showed my the variation she used in her Coriolis quilt and I being a rebel could not resist adding in just one more cut and shuffle. I had a great time and will be using my pile ( and piles) of left over fabric for more quilts from her technique over coming months. An added bonus was that I met a blog reader in the class, Tina whose blog is here. I have to say though that our conversation was odd - I kept trying to tell her stories and she would say, "I know, I printed that one out from the blog." Scary how much I tell you ! However, the inside, which is a mere 4 mins walk from the hotel I use has now become a destination in itself. It houses really good bakeries and M&S supermarkets and a 24 hr Starbacks ( mots in london clase, irritatingly at about 8pm) as well as a late opening brach of Foyles bookshop, all a tasetful blend of new glass and old brick archtitecture. The roof however, is what inspired me - these photos were taken whilst waiting for my boilded egg and bread basket for breakfast at Le Pain Quotidien. Feel free to take the photos if you want to use them as inspiration for your art. 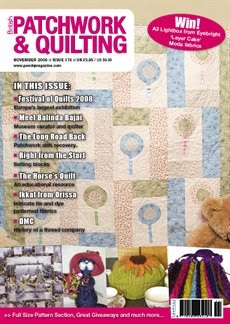 Guess whose very first pattern ended up on the cover of this months British Patchwork and Quilting? For some time now I have been going to a class in Penrith at Morceau. Billed as an 'occasional Saturday' ( but actually once a month) you can take anything to work on and get advice if you need it. At the beginning it was invaluable in starting me on my patchwork way but now I use it as a social event mainly. Sometimes I achieve a lot in a day, sometimes I gossip and eat a lot and some months there is a blissful combination of both things. In September, I was tired from work and really just wanted to hang out with no pressure on me to complete anything. So, I packed a bag with a wallhanging to fiddle with intending not really to do very much but hang out with my BQS (Best Quilting Buddy). On arrival in the car park, Yvonne, the teacher was leaning against her car wearing a jacket made of the boiled wool from the shop below the classes, Just Sew, which cloth has been highly popular with the class members. I myself bought three meters last year and have been diligently storing it ever since. However when I saw her jacket I had to make one, so I bought more wool and set to. The delight of it is that it requires no finishing to speak of, perfect for a non dressmaker like me. By lunch time I had made this. So cuddly and easy to wear. I mean I knew it existed- my Mum's house is full of beautifully executed examples of it, but I had never liked any of the kit pictures available and in any even saw it a bit like paint by numbers which does not stimulate the creative side of me enough to justify the time it takes to complete them. It transpires that because I already have the design part of the Certificate In Quilting that I need not repeat that section to get the C&G certificate in embroidery - I just do the actual stitching part. As I was about to embark on teaching myself in a C&G style anyway it kind of seems sensible to actually get the qualification and benefit from expert tuition. However, I also want to go on to do the diploma in patchwork and Quilting... which to do first? A dilemma! I think the solution is to slightly overlap the certificates so that I don't delay the diploma too long.... of course I know that there is no deadline or externally imposed timescale. But my own enthusiasm makes it painful to have to wait to learn how to do something I want to do now I have discovered my passion in life - I want it all NOW!!!! Enquiries are being made on a sensible way forward. My philosophy is that if I have to schlepp around the country for work, I may as well take advantage of it. So recently I travelled to London early to get to the Horniman museum and also went to a late opening at the British museum. Despite the dire lesson we had on my City and Guilds course on sketchbooks ( sum total advice: Cut some pictures out of magazines that are inspiring and stick them in) I have begun to understand the concept and purpose much better after reading this book. I have a lot to learn but in the hope that it might inspire you, I display below some of the pages I made relating to masks (although they do not photograph very well - sorry scanning is just too much for tonight) and then a photo of the largest masquarade costume in the world ( or some such like - its the biggest of some kind!) from the Horniman. I still find that my sketchbooks ar every neat note taking things rather than very artistic free pages. I did a very good online ocurse with Sharon Boggon through Joggles.com in which she gives very good tips, inspiration and examples of how to use a studio journal. Now I just need to start putting the lessons into practice! I am heartened that my disappearance for about twenty minutes ( well that's what I thought it was - readers tell me it is now over two weeks!) has been noticed and commented on. I am in fact safe and well.... apart from my left index finger. Yup, rotary cutter accident. One little slip, one large flap of skin, blood everywhere and two and a half hours in a minor injures unit. We fled the house in haste so all I had was purse and a soon read copy of Strip Patchwork ( books with black and white pictures are really not inspiring!). I resorted to paper weaving with their health care leaflets and a coffee stirrer and was about to embellish with Wheat Crunchies from the vending machine when I got called in. I was so annoyed with myself as I had finally got a few hours clear to myself and was embarking on a fabric book of City and Guilds samples when I slipped and did it. Such a waste of time. Dennis tried to ban me from the cutter at least for the evening on my return. But really, now the finger is so padded it is after than ever so I managed to transform a lever arch file with samples stuffed into plastic folders into this - I am much happier with it and plan to do the same for all the rest too. This is the book of traditional quilt blocks from the first few weeks - nothing interesting really! But my absence was really caused by work and pleasure travel. Since my last post there have been two trips to London a heavy week of days in Manchester for work and one trip to class in Penrith and another to a show in Harrogate. Next weekend I go all the way to Chilcompton ( about 4 hrs) to attend a class with Brenda. Not many sleeps now... very excited! However, the travel has in fact been very inspiring and I have lots to show and tell. At the moment I am in a rare local phase of work and am in my Chambers waiting out the rush hour so I am going to schedule several posts so that although I may not be able to post in person again for a while you will hopefully be entertained. ( do you people have nothing better to do?) Then when I get home I plan on adding photos to posts then sitting still with hot chocolate and reading 2 weeks worth of blogs on Google reader....! PS later... why do none of the notions companies make a pretty finger guard to sell with their cutters?